It’s time for some good old fashioned objectification on this week’s episode of Another Period. According to matriarch Dodo, “In my day, a woman was judged only on her fertility, silence, and threshold for pain.” But the times, they are a-changin’. No longer simply categorized and valued based on their ability to breed, women’s appearances define their femininity and worth at the turn of the twentieth century. “Pageant” in many ways rehashes the well-trod beauty pageant storyline. Still, its particular lampoon takes the opportunity to not only poke fun at everything and everyone involved in such a display, but also the formulaic narrative seen in many a movie or TV show. Newport’s Most Beautiful Pageant, yearly held at the Bellacourt’s mansion, may once have involved only vegetables (Dodo: “Only cabbages should be judged for their beauty!”), but in order to remain relevant the judges have broadened the show to include babies and women. To be clear, there are not separate categories for each one; the women, babies and vegetables compete together. Learning that the winner will be featured on a biscuit tin, Lillian jumps at the chance to use her beauty as a commodity. Beatrice follows suit not because she especially understands what’s going on, but because she typically follows Lillian’s lead. 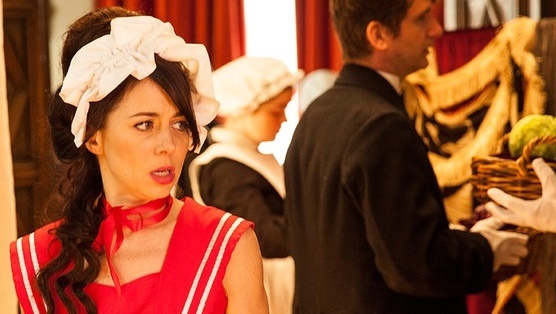 And Hortense stands up for women’s liberation by entering the pageant to reveal its inanity. Hortense’s plain presence naturally causes a stir. Host Dan Ringling (Jack Black in a wonderful cross between a 1920s circus ringleader and 1970s TV host Richard Dawson) quiets the murmuring explaining, “Though there is 100% certainty that she will not win, she is technically a female adult and therefore is allowed to enter.” The show has some cleverly overt lines that call attention to the traditional narrative structures they often engage. Rather than play these moments off as originality, Another Period has no problem openly calling attention to the beauty pageant narrative’s predictability. The Bellacourt sisters and three other female contestants submit to a series of exams. Measuring their busts, derrieres and teeth, Rigley examines the women as one would a horse, ensuring each stock is of good quality. As they open their mouth wide for him to see their teeth, he explains he’s looking for “32 teeth, no yellows, no wooden.” While the exaggerated nature of the scene lampoons real beauty pageants, it’s not far off the mark. Women don’t submit themselves to the kind of examination Newport’s Most Beautiful Pageant requires, yet they do face a similar level of scrutiny when it comes to their bodies and appearance. Watching the bathing suit portion of any contemporary pageant reminds women about the parameters in which they should fall. Rigley may use an actual measuring instrument to gauge breast to hip ratio, but that same instrument certainly exists unseen in today’s competitions. There’s a certain standard of beauty women must meet to be considered not only women but desirable. That becomes entirely clear when Rigley presents the participants with a silhouette cut out of a tall, slender-waisted woman with large breasts and a healthy rear end. It is a literal standard of beauty which each woman must pass through to see how she compares. First Beatrice and then Lillian pass this standard. Hortense not only fails but gets stuck in the cut-out and ends up ripping it apart. It’s a hilarious physical bit that shows off Lauren Ash’s comedic skills (Ash replaced original Hortense actress Artemis Pebdani after the pilot). Rigley disqualifies her based on her larger proportions, and she leaves with her Newport Association of Gal Spinsters (N.A.G.S.) to plot revenge. The show, which had several competing threads last week, here works in the service of one central plot: the pageant. Although each character has their own storyline, they’re all functioning together in a way that propels the episode forward. It’s not disjointed in the way Another Period has sometimes been in the past, and succeeds all the more for it. Along with commenting on female beauty standards, “Pageant” uses much of the episode to satirize women’s purpose in the world at the time. A male journalist covering the pageant runs into Hortense at the end who introduces herself as a writer. “A woman writer…what kind of cookbook are you working on?” he asks. Even if women move outside the home, they are forever connected to it; their professional identity is one tied to the hearth. Perhaps the best line from the entire episode, barring Dodo’s initial point about women in her time (and thank goodness Paget Brewster has returned to her comedy roots, for she is a hilarious talent sorely missed during her time on drama Criminal Minds) arises during the question and answer portion. Rigley asks Beatrice a tough question: “What is your favorite time of day?” After furrowing her brow and looking confused, Beatrice answers, “I think I should ask a man,” which earns her 10 points from each of the judges, all men, naturally. Another Period doesn’t pretend it’s anything other than goofy fun. In a lineup of other Comedy Central superstars like Key & Peele and Inside Amy Schumer, it’s not vying for the role of “groundbreaking new show.” Its strength continues to emanate from its talented cast, and its willingness to go big and broad all while landing sharp barbs in the service of commentary.